One of the easiest and most inexpensive ways to transform a space…paint. 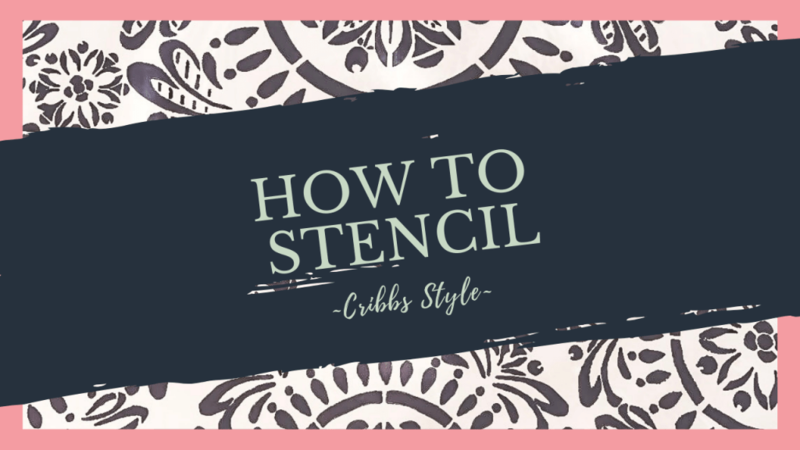 You may be tired of hearing me say this, but seriously the quickest, in my opinion easiest, and cheapest way to transform any space is to paint it. Paint can be tricky because lighting in the space is everything. Which is why our master bedroom came back on our project list. In an attempt to rescue our master bedroom from the PSL color that only a Starbucks Barista could tolerate, I painted. However, the color was reminiscent of a baby shower and not so much a master bedroom. 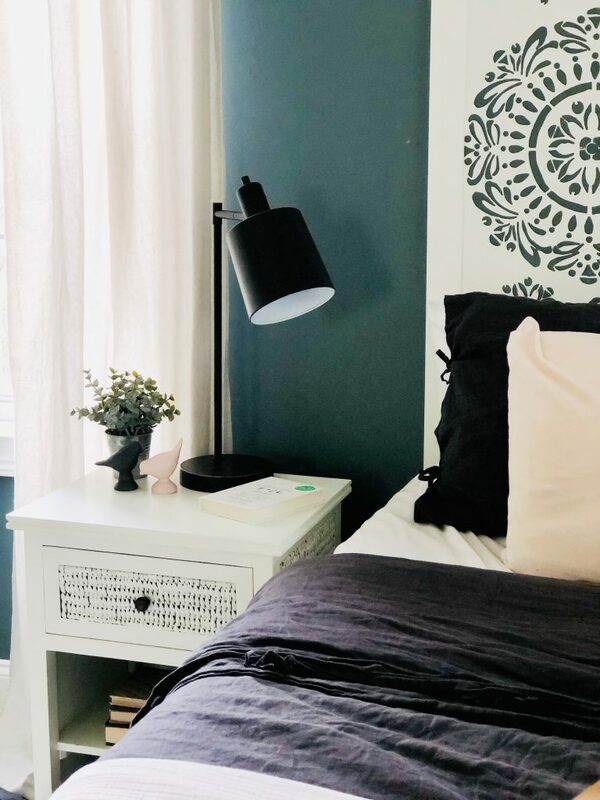 Enter the $100 Room Challenge from Erin of Lemons, Lavender, and Laundry. 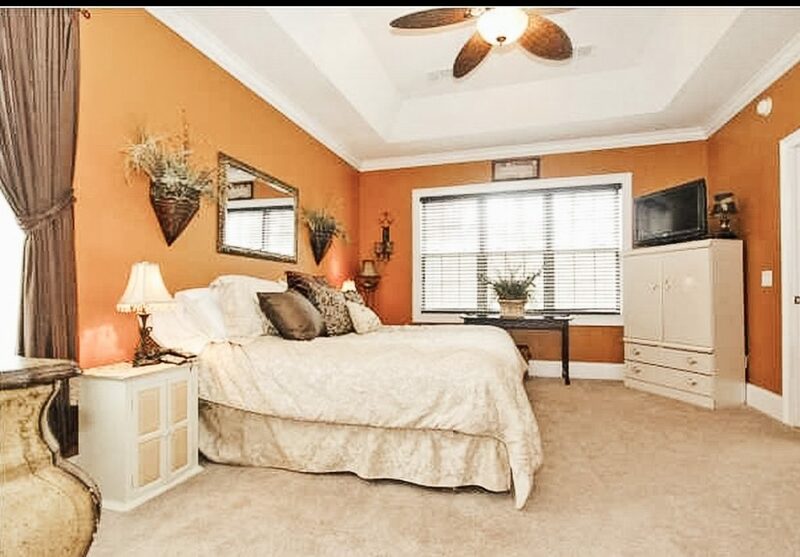 I wanted a refresh of the master bedroom, but didn’t want to spend a ton of time or anymore money. 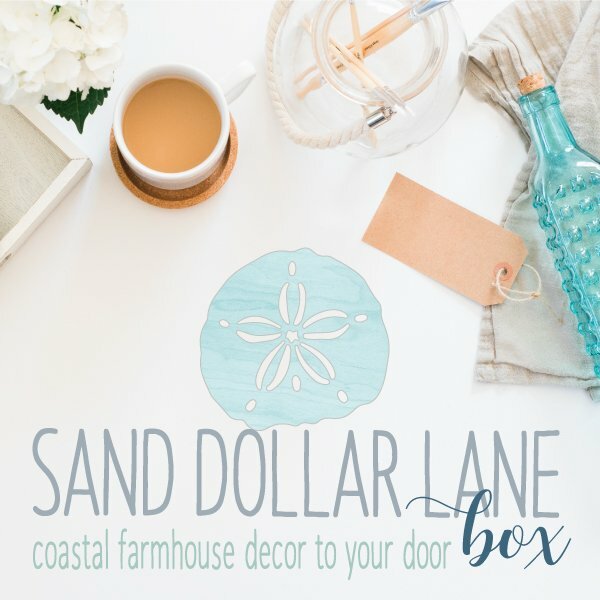 Join myself and other talented bloggers as we take on the $100 Room Challenge. First thing I did was paint the accent wall. I had fallen in love with Riverway from Sherwin Williams when I did the makeover in my master closet. Since I had a ton of paint left from that project, it was a no brainer that it would be the accent color behind the bed. Paint tip: Have a color you love, but like a different brand more? Most paint stores can mix it for you. 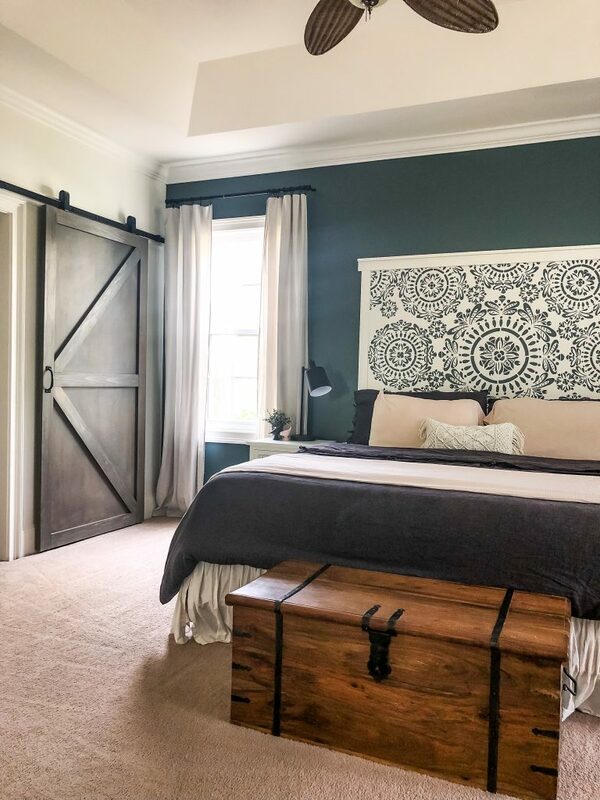 All the paint for this room was mixed at Lowe’s even though the accent color is from Sherwin Williams and the other three walls Benjamin Moore. I love how the headboard is a statement in the room now. 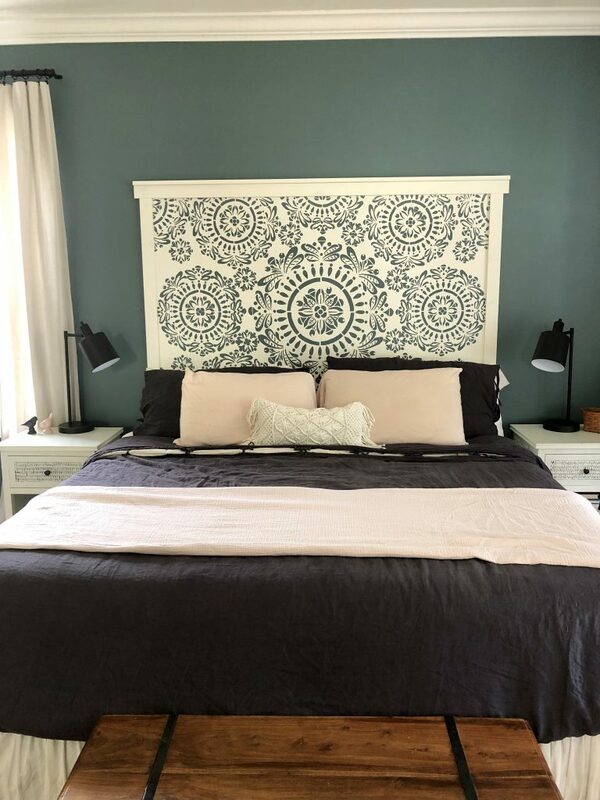 Of course last week I shared the star of the show, the faux headboard inspired by the hand carved wood headboard I found on Etsy. I call it more of a functional piece of art than an actual headboard, but the wow factor for this piece made the room everything I hoped it to be. 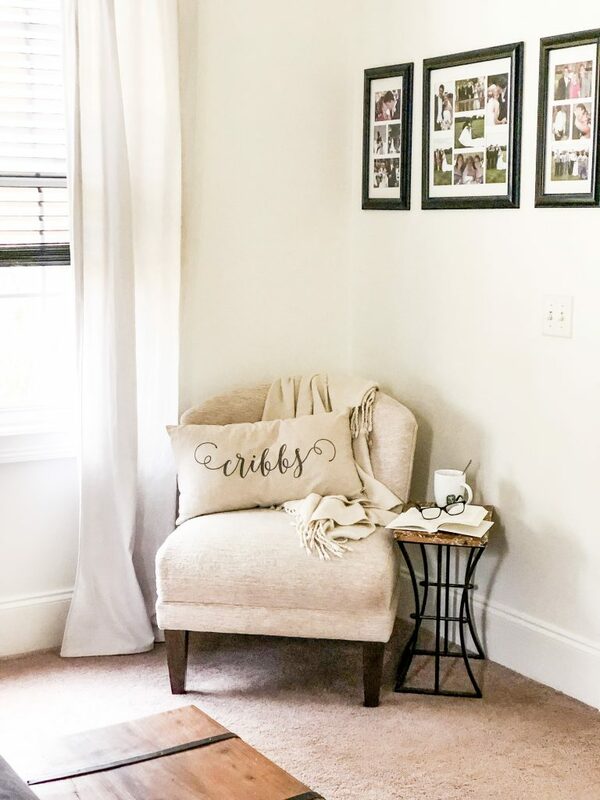 A comfy little reading nook. The other three walls were painted White Dove by Benjamin Moore, but again mixed at Lowe’s to keep cost down. I already had one can left from a previous project, but needed a second can. This allowed me to also paint all the trim and the base color for the headboard. Layering textures adds interest even though the all and the furniture color is the same. While the walls now matched the dresser and nightstands, painted a few years ago, the texture of the dresser helps it to not all blend in. Subtle changes can make a big impact. All the bedding was left the same, with the exception of the adorable pillow I found at Target . The pillow gave a boho touch to the bed and tied nicely into the headboard. The curtains are drop cloth curtains that I also already had and was using in the room. The white lumbar pillow is an outdoor pillow from Target. Let’s talk bottom line, how much did this all cost? So yes, I did go over the $100 budget by $8.79, but the pillow was totally worth it to me. I am so happy with the way the master bedroom turned out and can FINALLY mark it off my list of projects. When we bought the house. My failed attempt to make it better. Instead of feeling like my eyes are being assaulted or a constant reminder I picked the wrong color, now I feel a sense of peace. 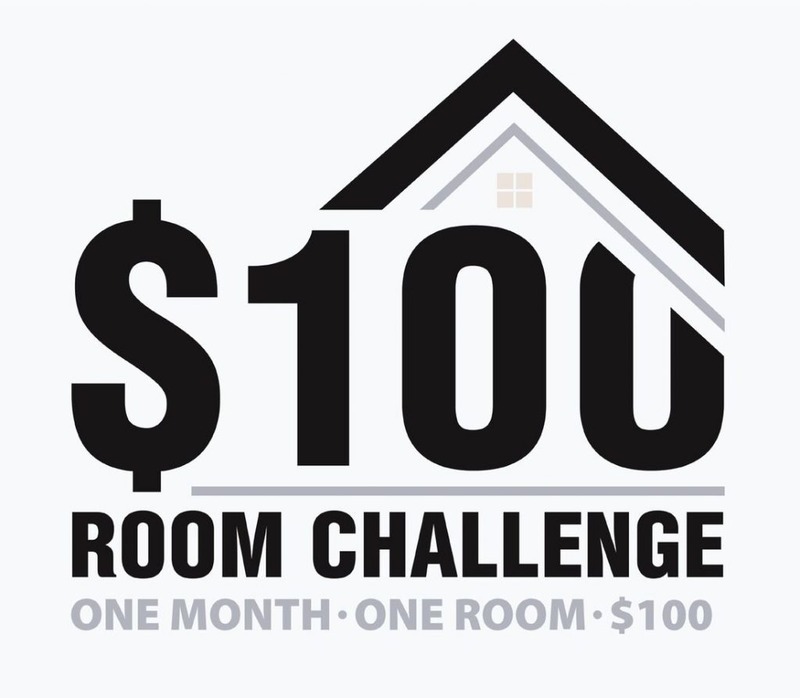 Don’t forget to check out the other amazing room reveals from the $100 Room Challenge below! Wow! what a change. You are so right about paint. I love the blue. It’s so serene and that headboard is like a work of art. So smart. Great inspiration for everyone on a budget. Thank you Patti!! The accent wall is definitely my favorite color! I love orange too, in small doses and not on my bedroom walls 😉 I definitely love the color too, it’s just enough of a pop. Thank you Marly!! I am just so in love that it now feels like a real master bedroom that I can feel relaxed in! I just LOVE how the entire space came together!!! You did such an incredible job!! Thank you Rebecca!! I am so glad to be done with it so I can move on! 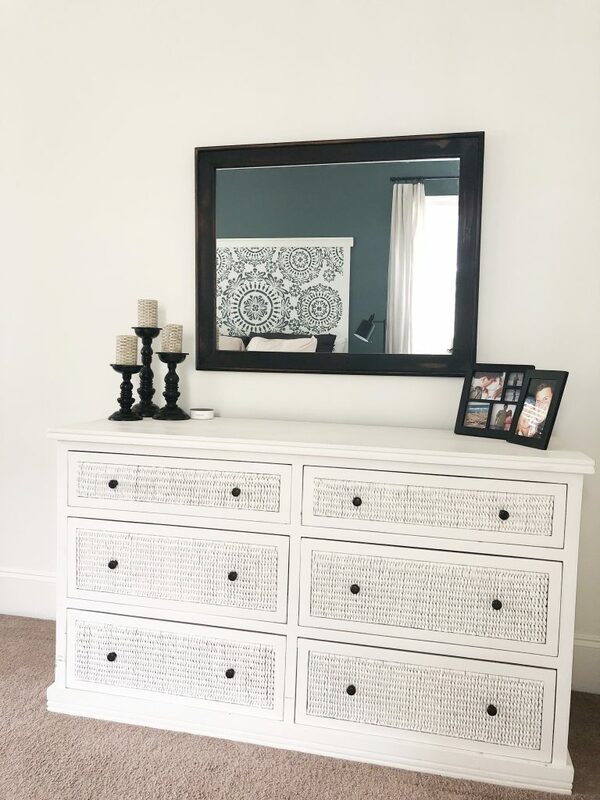 Brooke, this is one of my favorite room makeovers. I was so invested in this headboard when you were doing it on IG stories and it turned out even better than I thought it would. Great room and great wall color. OMG Sherry you are the BEST!!! Seriously, that is the sweetest comment of all!! I’ll tell you, for a minute I was on the fence on how this was going to turn out and then I just went with my gut. So glad that I did! Fantastic job! I am loving the headboard you made, it is such a perfect way to copy the one your couldn’t afford! Where did you get that bed skirt that drapes on the floor like that, because I want it in my life. I think I got it from either Homegoods or Target I’m sorry I can’t remember which. Wow, it looks amazing! Glad you got rid of the PSL color – haha! I love that headboard. It was the WORST! 😉 Thank you I am so in love with the space. LOVE that accent wall color! The headboard is also amazing! Thank you Vicki! I love the way it turned out too and I’m so glad that it’s done! I love this room! It’s so bright yet still cozy. And still in love with how you made that headboard! 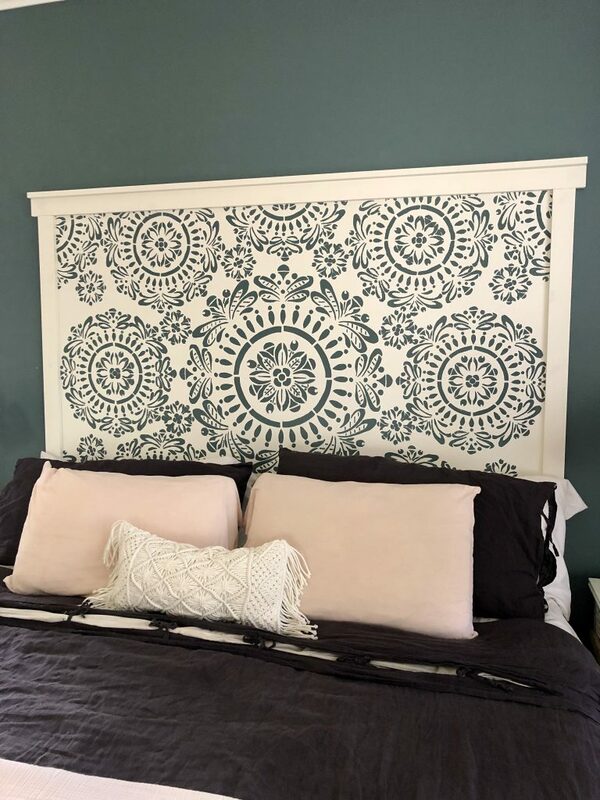 Great idea to do a faux headboard. I love it! Thank you Brittany!! I loved refreshing this space and making it more our style. I am so impressed by this makeover! That headboard is so great and the pillow was totally worth it! Congrats! That headboard really is beautiful in this room! 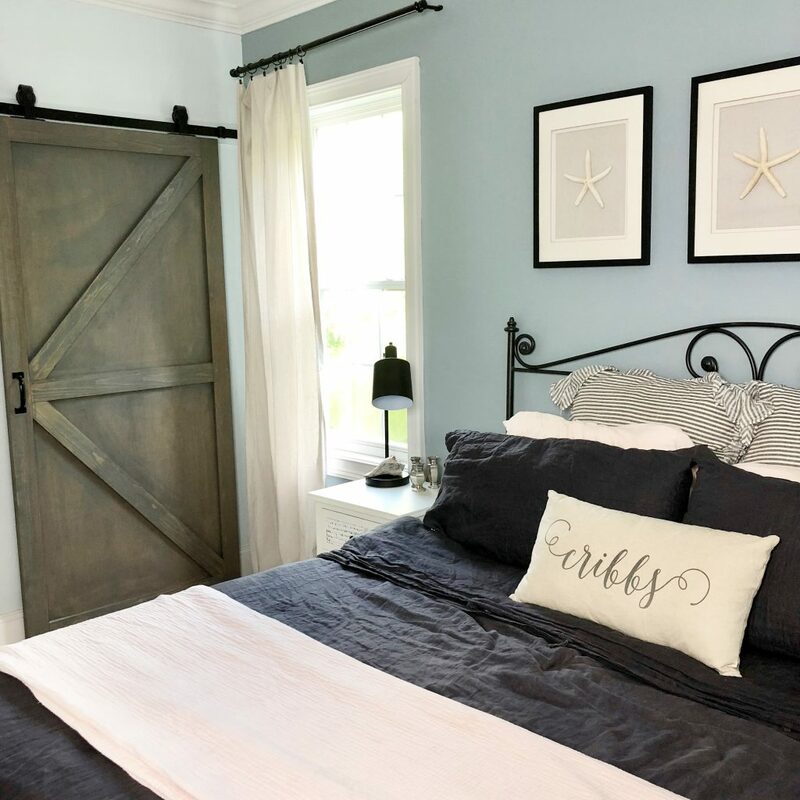 I love the color scheme, and with the barn door… perfection! And while you may have gone a little over budget, that pillow is SUPER cute! Thanks for participating in the challenge and sharing all your creative inspiration! Thank you again for hosting! I am already trying to figure out my next space. Wow! what a transformation. I love the blue color, the power of paint never ceases to amaze me. Also, the headboard came out fantastic! Stunning transformation my friend! 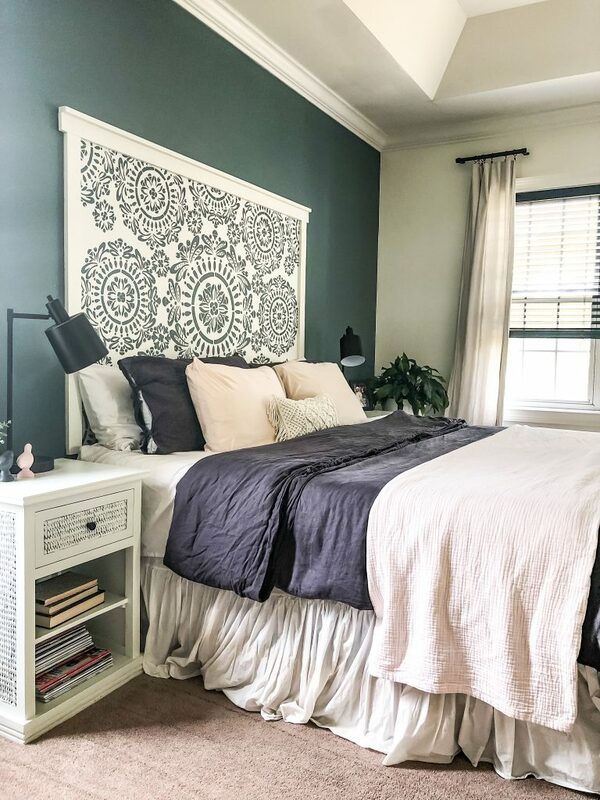 Love the accent wall and the headboard is swoon-worthy!